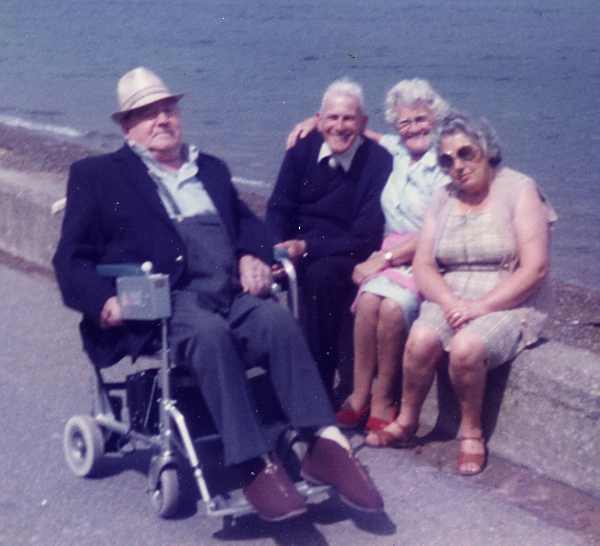 Alistair (Gaffer) MacKenzie, ?, Violet Russell and Betty Hogg taking the sun on the wall on Shore St. Betty still sits there to this day. A picture of Gaffer in his piping days can be seen in picture #28. The gentleman whom Violet has her arm round is "Rex" Skinner who lived in Gordons Lane. I think the ? is Rex Skinner the coastguard - his brother Bummy was lifeboat mechanic at Blyth. Many happy memories as a child, of Betty Hogg when I stayed on holiday with my family in Gordons Lane in the late 1960s and early 70s. Remember she gave us veg from her garden and took us to the Cromarty Arms for a sing song I think. Remember daughter Margaret and her son Alan as a little boy, and Willie. Betty Hogg was a very powerful swimmer, and it is not known by many in Cromarty that she holds a Royal Humane Society Medal, and Certificate, for saving life from drowning, in the sea off Cromarty. I can just smell the sea.